Has your e-reader (or ipad, or camera, or cell phone) been complaining about the cold recently? Why not make it a crochet cover? If you`re saying “because I can just buy one for pretty cheap” I do see your point BUT that will rob you of the satisfaction of being able to say when people ask where you got your cool cover, “You can`t have it! It`s mine! I made it! I`ll know if you steal it because it`s an original and I can see the mistakes I made on it! Go away and stop asking me about it! Go!” You want to be able to say that right? Of course you do so let`s continue. It`s covered with wool and has a button, true, but it lacks that certain je ne sais quoi that an actual crocheted case possesses. B) Worsted weight wool (with a contrasting colour unless this is strictly a utilitarian piece or your device simply will not be seen in anything embellished), a 5mm crochet hook, a button, and a darning needle. Still life entitled Wool, Size 5mm hook, Button and Darning Needle. Also, coincidentally, all the supplies you`ll need for this project. C) The Pattern, which is as follows (please note that I have never written out a pattern before so if it is confusing, please message me and I`ll try to help you out.). This pattern uses Moss stitch or Seed stitch – I`ve seen it called both and don`t honestly know what the actual name is. I am Team Moss stitch but if you strongly believe I`m wrong and you are Team Seed stitch then let`s just get our teams together and meet up in an alley and have it done with once and for all, West Side story styles, ok? Ahem, the pattern….. Rows 2 – 54: sc in first visible chain space, ch1. Repeat sc, ch1 in each chain space across row. In last stitch, sc, ch3, turn. Row 55: Repeat the sc, ch1 in each chain space across row but in the last stitch sc, ch1 and then begin to sc all the way around your piece (down the left side, across, up the right side and across) with 2sc in each corner. 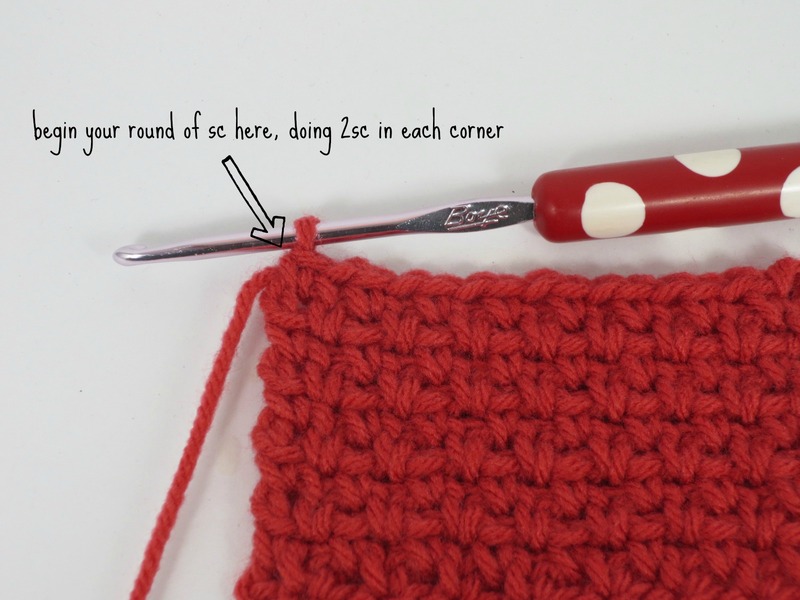 Do a row of single crochet all the way around the piece. Once back to the top left hand corner, ss to the next visible sc (see below) and leave a long (about 50 inches) tail for sewing the sides together. 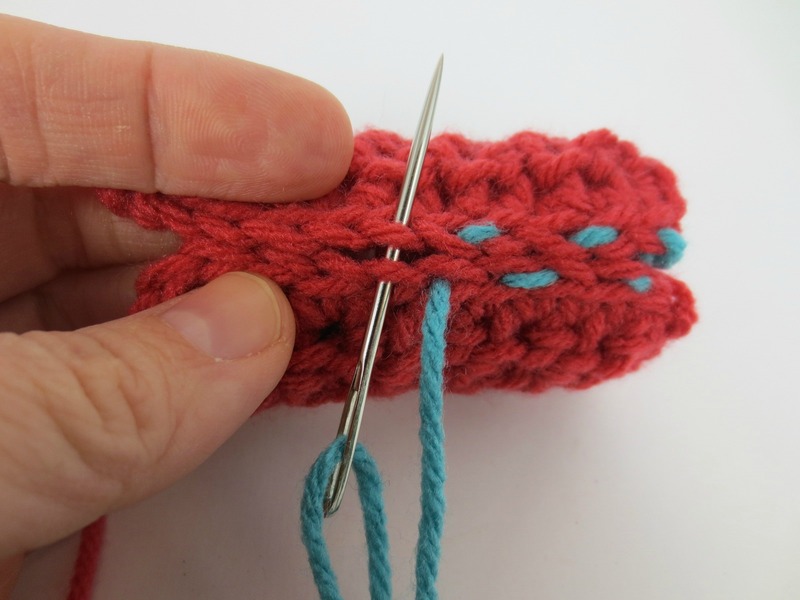 Fold the piece in half and starting at the top left corner, join your edges with a whip stitch. To make it more visible I`ve used a contrasting colour in the picture. When I get to the fold, I just run the thread across on the inside of the cover and then start up again with a whip stitch at the bottom right hand corner. Tie off and weave in ends. Join a contrasting colour at the top right hand corner and sc all the way around the top opening. 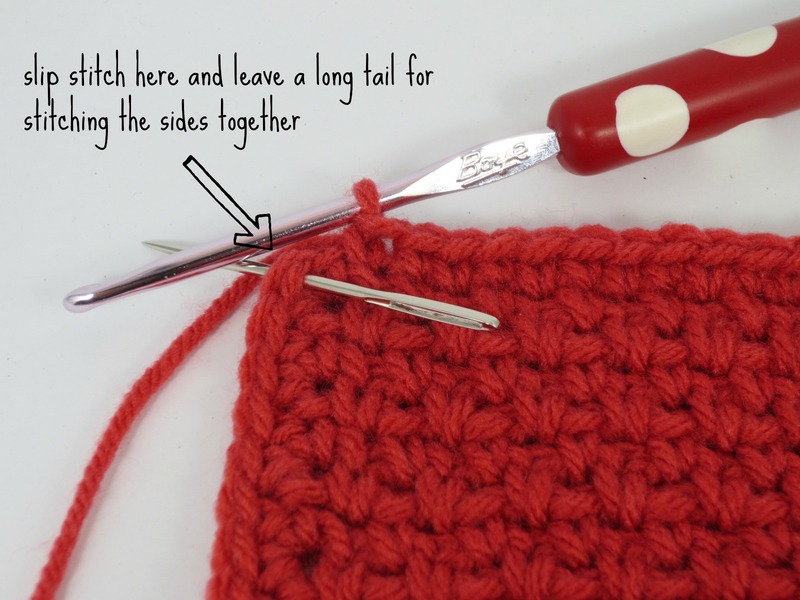 Do a second row of single crochet and when you get half way across the back of the piece, chain 20 and slip stitch back to the next sc on the cover to make a loop for your button (see pic). A cosy cozy for your Kindle! Voila! No longer will you have to cover your e-reader with a mitten, leaving yourself with only one mitten and your e-reader looking, well, ridiculous frankly. I actually decided to line mine as I had some material that matched perfectly and I like those kinds of details. I chose the simplest possible way to do it : when the piece was just one long strip, before folding it and stitching up the side, I cut a long strip of material to the same dimension (plus 1/4 inch for a seam allowance), sewed a seam around all four sides, lay in pattern side up over the crochet piece and stitched just the top and bottom edges to the crochet. It works well but leaves it looking a little unfinished. See what I mean? Tsk, tsk, tsk. That`s what I get for being lazy. I have since lined items using this tutorial and avoided that unsightly gap. Not, strictly, an e-reader cover but rather a camera case cover which is the same pattern, only smaller. Unless your camera is the size of an e-reader or vice versa. So, there you have it folks. Categories: Crafty, Crochet, diy, tutorial | Tags: camera case, Craft, crafts, crochet, crochet e-reader cover, diy, ipad cover, Pattern, tutorial | Permalink. These are lovely! I’d love to make one, however, I’m a very lazy crafter lately, maybe this is the inspiration i need. Your post made me laugh a lot, I particularly like the still life, beautiful! Thank you! I too, go through lulls with my crafting. I generally get a ton done when I have deadlines for other more important things, like work and school! I appreciate the compliment and would love to see your results if you try one. These are adorable! I love the purple one. I’m going to attempt one of these for my tablet! Thanks! Thanks for looking! Let me know how it works out! Soooo cute! My Kindle needs a new sweater! Thank, glad you like it! I hope that its user friendly to read – message me if I`ve made it totally confusing. I hope you, and your presently naked Kindle, enjoy!